Archery can be an empowering sport that not only looks cool but is rewarding as well. There’s no better feeling than hitting the bull's eye during target practices and tournaments. The skills you learn from archery can also be helpful if you want to venture into animal hunting. Of course, you need to have a reliable bow and a sharp arrow. When you purchase archery equipment, most experts suggest that you get a recurve bow which is suited for your body frame, muscle strength, and skill level. This is important because it will help you shoot the arrow with the right speed and force. If you choose the wrong type of bow, not only will you not be able to use it, but you will also have trouble learning how to shoot and could end up hurting yourself or damaging the bow. There are a few things that you need to consider when purchasing a recurve bow and we've briefly discussed them below. When you start searching for a recurve bow, you will notice that there are a lot of features that you need to understand. Although all of them are essential, some specifications may have a significant effect on your safety and comfort. One of them is the bow's draw weight. Choosing the draw weight will highly depend on your strength and age. If you’re younger, then you go for a bow that has a drawback ranging from 16 to 20 pounds. If you’re older and more athletic, then a recurve bow with a drawback of 25 to 35 pounds is recommended. Another factor that you need to look into is the bow's orientation. Sometimes users get confused when they’re trying to select the appropriate box for their hand orientation, but it’s really simple. You just need to know which is your most dominant hand and which hand would be used to draw the bow back. Generally, if you’re right handed then you need a right handed bow. This bow will be held by your left hand, and you will then draw the string back with your right hand. The left-handed bow will be held by your right hand, and the string will be pulled back with your left hand. When purchasing a recurve bow, you may also want to consider if what you need is a hunting or a recreational bow. The selection process can really be overwhelming, so to help ease your search, we have reviewed a recurve bow kit that might work for you. Southwest Archery is amongst the highly recognized manufacturers of archery equipment, accessories, and kits. They are a USA-based company that has been around for more than two decades, and their Samick Sage team specially designed this particular bow. 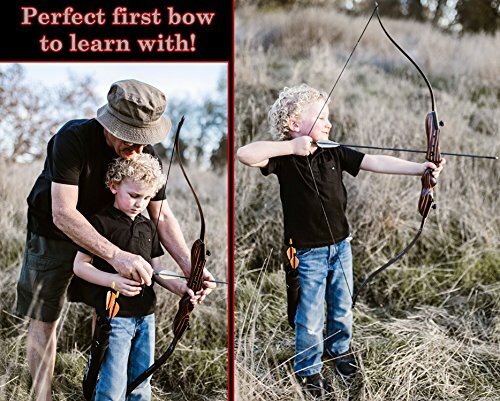 While the Southwest Archery Little Tiger Takedown Recurve Bow is great for both beginners and experts, sometimes it may not be enough. 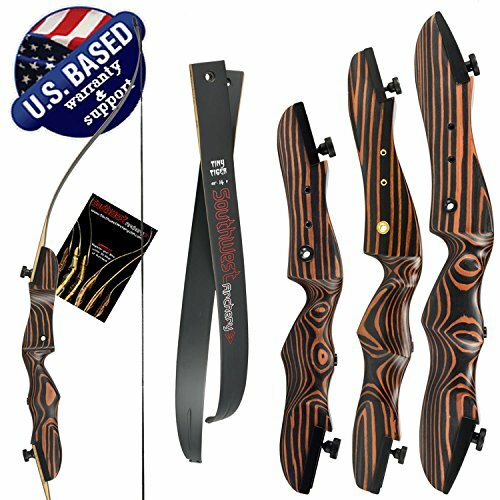 Thus, we also have another recurve bow that we can recommend to you. The Southwest Archery Tigershark is another takedown recurve bow that comes with an arrow set and has been crafted by the Samick Sage group. It has a length of 62 inches and is designed for both right and left-handed people. It has a draw weight that ranges from 25 to 60 pounds, making it perfect for intermediate level archers and experts who are looking for a bow that can be used in various activities. Also, if you’re looking for a bow with a satin finished riser with well-rounded edges and has reinforced limb tips to help improve its look and performance, then this is the bow for you. It also looks fantastic and is great to put on display. Further, if you’re not completely satisfied with the product, you can contact the company as you will be provided with a one-year manufacturer warranty from the time you purchase it. While there are many other recurve bows on the market, the Southwest Archery Little Tiger Recurve Bow is one of the best deals. It’s been specially designed by the Samick Sage group which only uses wood that is naturally sourced. This provides the bow with a beautiful finish and also makes it very environmentally friendly. You have the option to get either a right or a left-handed orientation, and the drawback weight is very versatile which makes it perfect for all genders and body frames. This model is one of the newest models and has been redesigned as one of the award-winning bows for 2018, which makes it one of our top picks, especially for beginners, children, and teenagers. Not sure what to look for in a recurve bow? Check out our recurve buying guide!